A few miles south of I-70 in Western Colorado, and we were in a canyon. 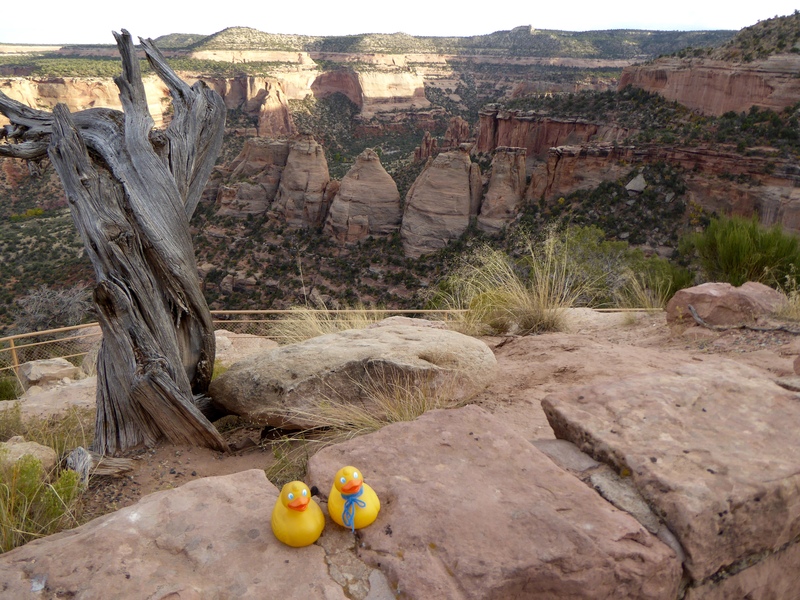 Today, Zeb and Soapy Smith Duck experienced Colorado National Monument. We are on the Redlands Fault now. Between 40 million and 70 million years ago, the earth moved. 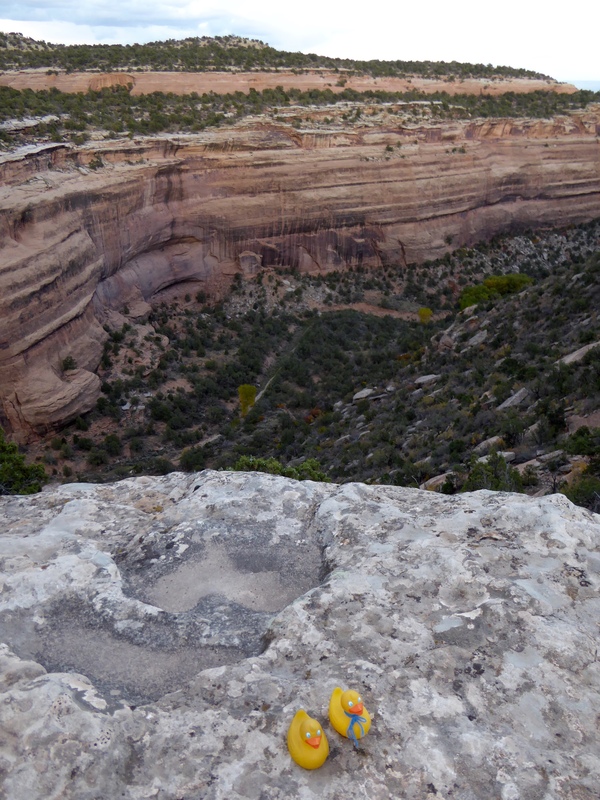 Subsequent erosion produced this, the Colorado National Monument. The canyon wall is gorgeous. Nature is so powerful. 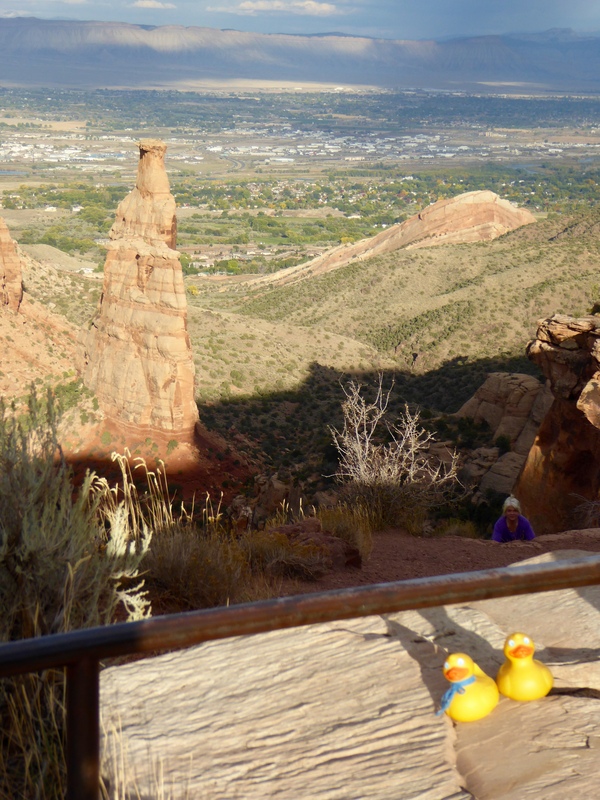 This balancing rock fascinates the Colorado Traveling Ducks. 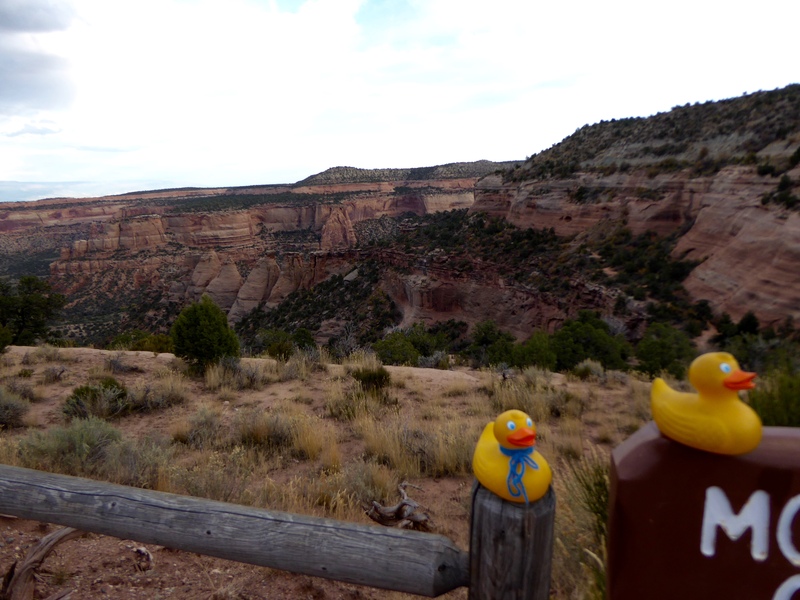 Around another curve and we stop to enjoy Fruita Canyon. We admire these Rocky Mountain Bighorn Sheep as they stroll along the road. They are within a foot of our car. Erosion has formed Independence Monument. Amazing. 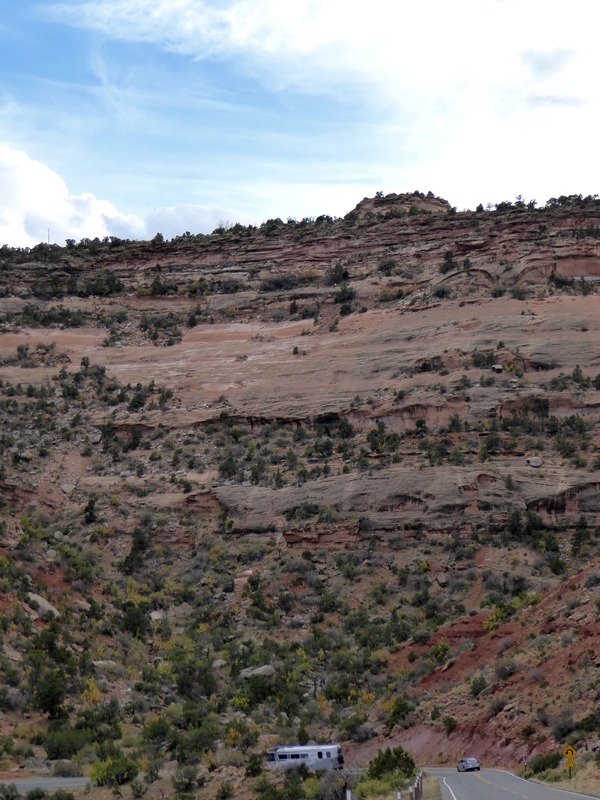 In this canyon we see the “Coke Ovens”. 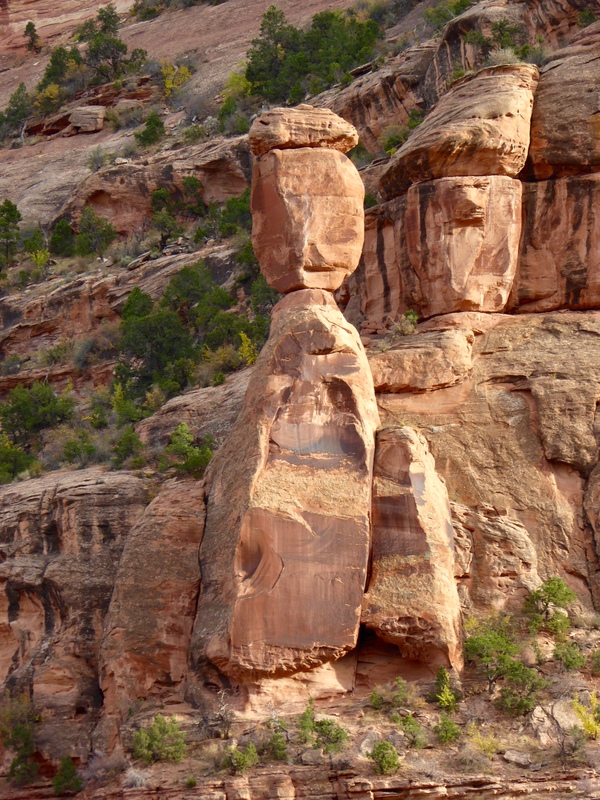 Erosion shaped some of the rock into the domed shape of Coke Ovens. Real Coke Ovens are used to transform coal into coke, a fuel that produces little or no gas when burned. Colorado has coal mines, and coke ovens were frequently used. Another beautiful view here in Monument Canyon. Looking at a canyon wall, we ducks see so many places for nests and dens for animals. 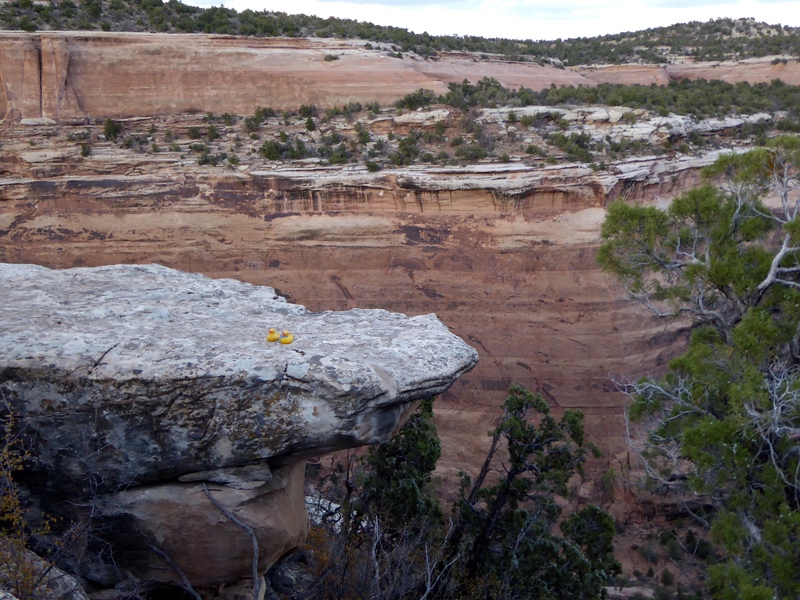 Now, in the Upper Ute Canyon we stop to admire another wonderful view. But wait—mom, where are we? It seems that there is only air under our resting place. The wind is calm now, but you know that wind comes up quickly in the mountains and canyons. We think you should get us off this ledge. OK, we are now safely back in our traveling bag. 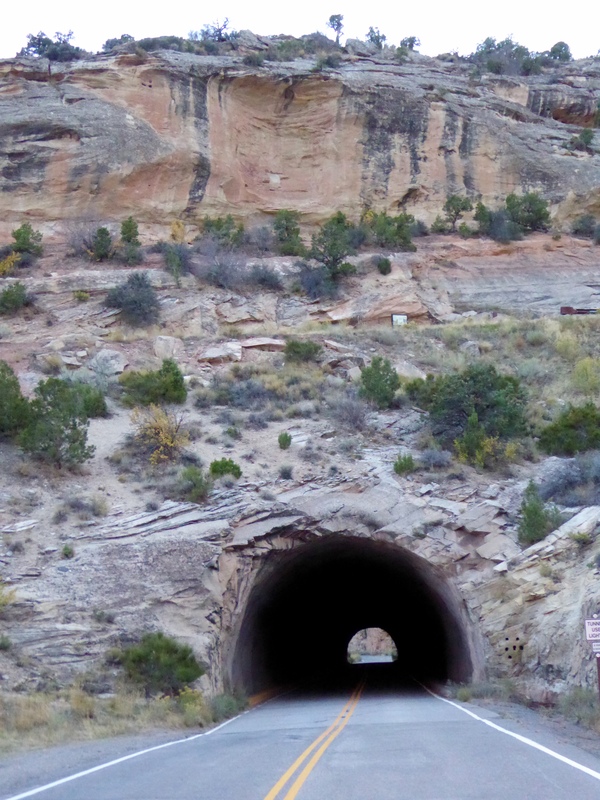 Driving on this 23 mile road through Colorado National Monument, we went through three tunnels like this one. We like tunnels, mountains and canyons. There is so much more to see here and so many trails to hike. 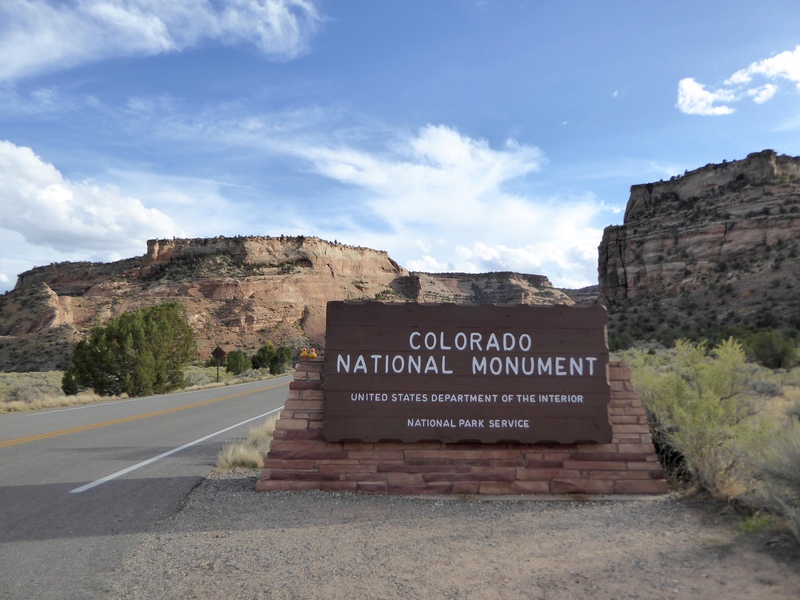 We hope you stop here when you are on Western Colorado’s I-70 near Grand Junction. 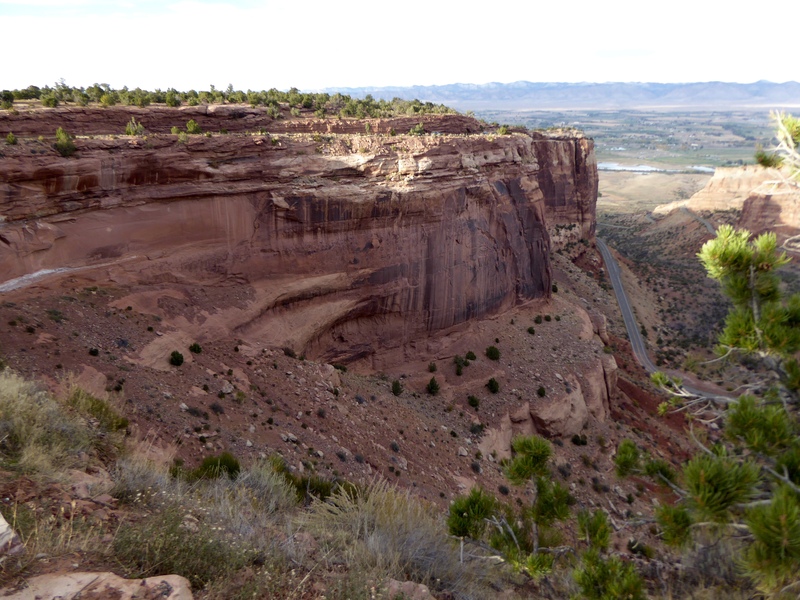 When you see the sign for Colorado National Monument, try to spend a couple hours or a couple days exploring here. It is beautiful. 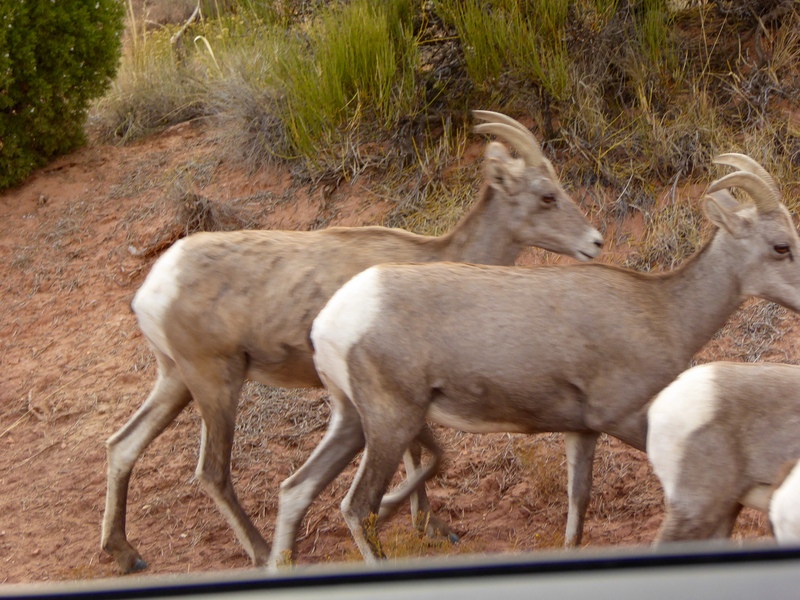 This entry was posted in Colorado, Uncategorized and tagged Bighorn sheep, coke ovens, Colorado, Colorado National Monument, Colorado Traveling Ducks, Grand Junction. Bookmark the permalink. We visited that a few years back. I am still impressed! We hadn’t seen the Grand Canyon at that point and thought that nothing could exceed the beauty of the Colorado National Monument. It is spectacular. We are blessed living with the Rocky Mountains, but we make ever effort to always appreciate each location for it own beauty. 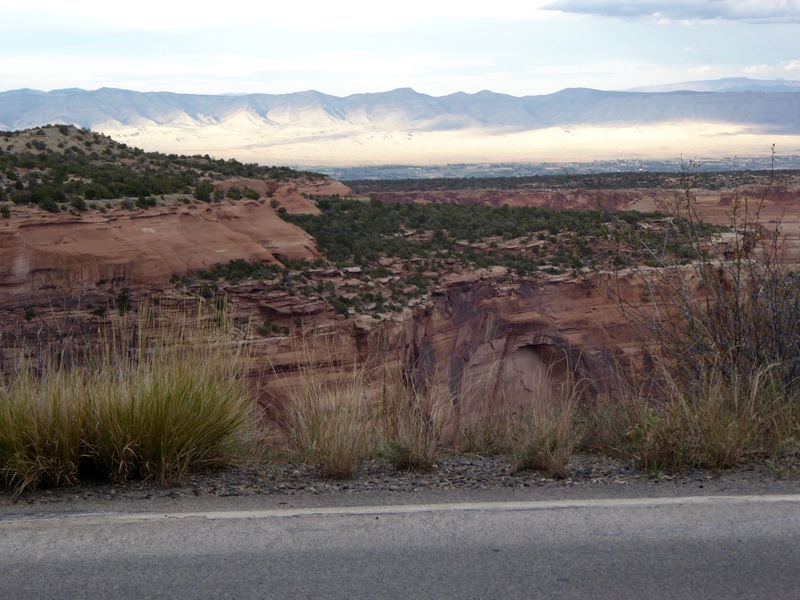 The Colorado National Monument is so close to I-70 that we can enjoy the spectacular views more frequently. Glad you visited here also and enjoyed the beauty. Thanks for reading and commenting.